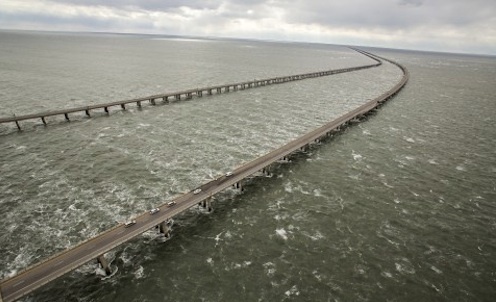 On Thursday, a North Carolina truck driver’s rig plunged off the Chesapeake Bay Bridge-Tunnel during high winds. The driver initially survived the crash and made his way to the roof of his floating truck but was unresponsive when he was rescued by a Navy helicopter. Tragically, he died on the way to the hospital. Joseph Chen, 47, of Greenville, had been a truck driver for about 20 years and worked for Evans Transport LLC for the last 10 years. He was on the job when he crossed CBBT on Thursday at about 12:30pm. 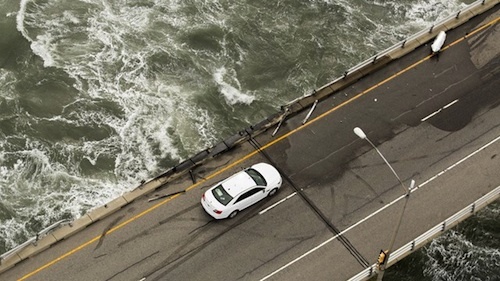 The bridge is 17.6 miles from shore to shore and 20 miles between toll plazas, and known to be a dangerous stretch for truck drivers with or without high winds. When Chen crossed the bridge, there were Level 1 restrictions – meaning winds are in excess of 40 miles per hour but tractor-trailers can still cross. Level 2 restrictions are applied when gusts are more than 47 miles per hour and tractor-trailers must be hauling at least 30,000 pounds in addition to the weight of the rig in order to cross. The Level 2 restriction was applied about half an hour after the crash. Tom Anderson, CBBT’s deputy director of finance and operations, said the accident is still under investigation and it's still not known if other factors such as driver error had a part in the crash. According to CBBT Police, their preliminary investigation confirms that Chen had just passed another tractor-trailer and as he re-entered the lane, he somehow drove over a curb and went airborne. The rig went off the southbound span at the mile marker 15, near the Eastern Shore side of the tunnel and plunged into the water. Investigators are hoping the truck's black box can be recovered to provide more information. Carl Skinner has been driving trucks for 16 years and knows what it's like to drive a tractor-trailer across the Chesapeake Bay Bridge-Tunnel. 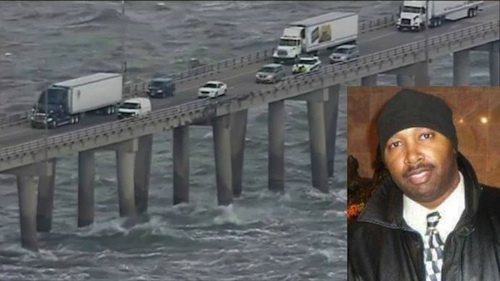 When he heard a truck went off the bridge in windy weather Thursday, he first thoughts went to Chen’s family and he said even when the CBBT's wind restrictions allow trucks to cross, drivers have to be careful. "It's a big decision to go across that bridge, and you have to use some common sense. That bridge is 17 miles of scary. It ain't no joke." October 13, 1979, McAuther bridge, St Louis. landed on river bank. One tiny false move. Wife and I survived. They need to install a better system of guard rails to prevent CMV rollovers, and name the guard rails Chen rails to honor Joseph. That's because most of our highways were built before 53' long 13'6" tall trailers were common. At the time the common truck was a cab over with a 45'long 12'6" tall trailer. I've driven that bridge several times in car's and big rigs,it's not very fun when you have high winds in a car let alone in a truck. My prayers go to his family. Have crossed the bridge in a car many times and at times it is scary for any vehicle the wind gets so strong it can push you around in seconds. RIP in peace driver prayers to the family so sad to lose another brother out here on the road . Wow. RIP Driver and prayers sent out to the loved ones. I crossed it once hated it decided rite then and there I'm a land lover. Rip brother. My condolences to your family and friends. That's one scary bridge, I never liked to cross it. My Condolences in the loss of your loved one..Gone to soon but will never be forgotten. I'm so sorry, my condolences to the family and friends, prayers send to his family RIP! I am a trucker and my heart aches. I will now rethink and rethink when there are level ones and two wind restrictions. May God Be with the family. REST IN PEACE BROTHER, WE'LL SEE YOU SOON. GO WITH GOD DRIVER. MY CONDELENCES TO THE CHEN FAMILY. SORRY FOR YOUR LOSS. Then they should have a taller rail alongside. This is completely preventable. prayers to his family. what a horrible and tragic death. Condolences from a fellow driver. Rest in Peace, Brother. RIP driver!!! & prayers for the family!!! I hate that bridge!!! Sad, my condolences to the family. God has control now you can relax, R.I.P. Brother trucker!! R. I P. MY BROTHER! Prayers for his family. What a terrible tragedy. So sad. God bless his wife and children. RIP Driver and prayers to your family! R I P driver.Prayers to family. Very sad, rest in peace driver ! Hate this bridge! I'll take the tunnel anyday. Is that the Bridge on 50 / 301 ? Rest in peace, brother trucker.